Fybogel Mebeverine contains two active ingredients: mebeverine and psyllium husks. Mebeverine is an antispasmodic agent used to treat (abdominal) cramps. Psyllium husks, also known as ispaghula, are portions of seeds of a plant called Plantago ovata, which belongs to the plantain family. This product remains undigested in the gut where it is absorbs water and produces slime, thereby increasing the volume and softness of stool and making it easier to pass. Fybogel Mebeverine is prescribed to treat constipation (blockage in the bowel) and irritable bowel syndrome (IBS), a gastrointestinal disorder characterized by abdominal pain and bowel movement problems. Fybogel Mebeverine softens feces and relieves cramps to reduce or cure these symptoms. Fybogel Mebeverine comes in powder form and must be dissolved into a glass of cold water. Stir well and drink immediately. 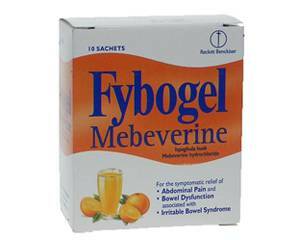 Fybogel Mebeverine should be taken spread out throughout the day, half an hour before meals. It is important to drink plenty (at least 1.5 liters) during the day. Because Fybogel Mebeverine is high in fiber it absorbs additional moisture. Neglecting the intake of extra fluids can cause the constipation to become worse. If you have forgotten to take a dose, you may take the missed dose unless it is almost time for your next scheduled dose. The duration of the treatment is decided by the doctor. Fybogel Mebeverine is not suitable for children under the age of 12. See package leaflet for more side effects, warnings and contraindications. Psyllium husk does not contain harmful substances and is therefore safe to use during pregnancy and while breastfeeding. However, mebeverine does get into the bloodstream and breast milk. It is therefore advisable to only use Fybogel Mebeverine with the doctor's approval if you are pregnant, planning to get pregnant or breastfeeding. Fybogel Mebeverine does not affect your ability to react. With Fybogel Mebeverine there are no food or alcohol restrictions.